The couchsurfers are both crying right now because there was a mistake and they no longer have tickets on a flight out of Palau like they thought. I think I need to go into witness protection to get out of this situation. Changing my name to Mufasa . . . Shortly thereafter, Daniel messaged me to inform me that he ran into them at home and they had somehow convinced a man, whom they had already convinced to take them on a boat trip for the entire day, to drive them around the country so they could resolve the flight problem. They were very distraught because the guy told them they might not be able to go on the Rock Islands boat tour now because of the delay in having to drive them around. And they were shocked. "VHAT!?!? No tooorer?!? But vee vere soo soooo sooo excitedz!!!! Guys. Daniel and I are going to Hell for our attitudes alone. Whatever. As long as we don't have to host these couchsurfers there, I don't really care. Ok, and so this one isn't from my phone. 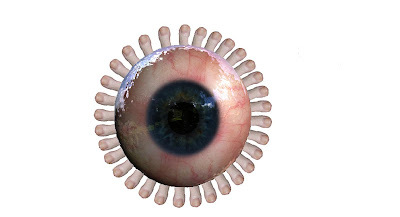 It's the most accurate depiction of The First Eye that has ever been created, despite not quite having 1,000 toes. Thanks, Flo, for sharing your creativity. This is the stuff of nightmares. When parents text. Thanks, Michael. Woman who eats cat hair. Thanks(? ), Angela. Your cat could be a killer. Thanks, Maggie. Reality tv celebrities spent all their money prior to the Mayan Apocalypse. Thanks, Shea. And a little flashback to all those who grew up in the 90's. Thanks, Krishelle. Please don't ever stop blogging. Not sure how I would make it through the day without it. No pressure, obviously. That picture is way way better and creepier than the ones we used to draw during church when we were kids! Scary!!! Also, credit goes to Kimberly for that link. She shared it on FB this week. I'm starting to get a little suspicious about these Germans. That The First Eye picture is INCREDIBLE!!! Wow… the cat killer article was very entertaining. In the country, we intentionally keep a cat or two to kill mice, rats, and snakes! They aren't pets; they just live outside for the sole purpose of keeping the snake and mouse population low. Apparently scientific city people are just figuring this out? Lol. Um.. I have no words to describe that picture.. lol but why haven't you used it yet for your animals tab instead of having the crappy hand drawn one? And I should have never clicked on the link of the woman who eats cat hair. Gross!! !